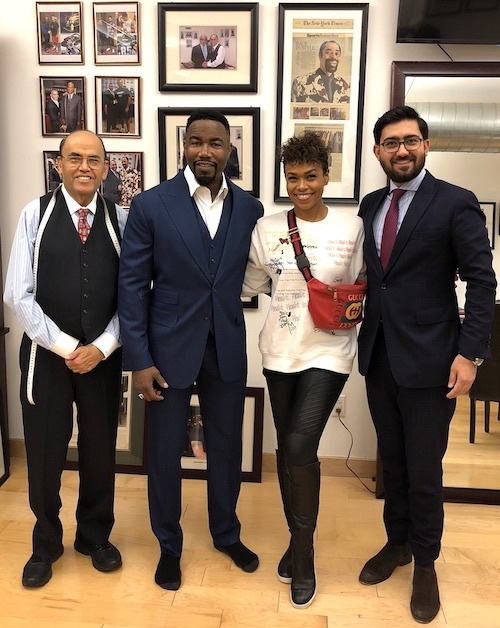 Mohan’s Custom Tailors had the great honor of creating custom suits and custom shirts for Michael Jai White, the New York-born (in Brooklyn, NY) film and television star and martial arts legend. Mr. White began his career in his teens as a Karate instructor, and went on to hold black belts in in Shōtōkan, Taekwondo, Kobudō, Tang Soo Do, Wushu and Kyokushin. According to Jet Magazine, he had the distinction of being “the first Black superhero to make it to the big screen,” portraying the title role in Mark A.Z. Dippé’s 1997 film, “Spawn”. The renowned actor has also appeared as Marcus Williams in the Tyler Perry films “Why Did I Get Married?” and “Why Did I Get Married Too?” and in the television series “Tyler Perry’s For Better or Worse”. He portrayed Jax Briggs in “Mortal Kombat: Legacy”, boxer Mike Tyson in the 1995 HBO television movie “Tyson”, the title role in the live action film and animated series, “Black Dynamite”, and Gambol in Christopher Nolan’s blockbuster, “The Dark Knight”, among many other prominent parts. Mr. White, and his wife, actress Gillian Iliana White, collaborated on every part of the selection process for his bespoke tailored suits and shirts from Mohan’s, first meeting with Victor Mohan and one of the company’s master tailors for an initial consultation in Los Angeles. Then Mike Mohan, CEO and Founder of Mohan’s Custom Tailors, Victor Mohan, KJ Singh and the Mohan’s team handcrafted to all specifications slim-cut, three-piece (including vests) custom suits, made of the finest wools, and custom shirts, and conducted the final fitting for the garments in our New York City showroom. Mr. White of course, has a strong-built, muscular frame, so our process had to be very precise to ensure the best possible fit and feel for his body. Please make an appointment with Mohan’s Custom Tailors for a consultation for your own bespoke masterpiece. We are conveniently located across the street from Grand Central Station. You may call us at (212) 697-0050, or complete the brief form on the “Book an Appointment” page of our website.